I was so glad to be asked back into Girlichef’s book review circle. It’s been a while but we’re back with another fantastic book to review over the coming weeks. I was happy to take part in all of the previous reviews but this one from Meagan Micozzi is going to be particularly awesome! 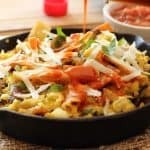 For the next three weeks myself and some other bloggers will be highlighting some of Meagan’s recipes through The New Southwest Cook Book Spotlight. Meagan’s new book, The New Southwest will be released on October 23, but you can always pre-order by clicking the link. She’s the brains behind the blog Scarletta Bakes and I’ve been following her writing and cooking for a long time. I know this sounds cliche but if you haven’t visited her blog, then you should start. Her writing is quirky and funny with a touch of personal and the recipes she conjures up are magnificent. Meagan hails from Arizona and this is the basis for her Southwestern cooking, with classic dishes like skillet-baked corn pudding, arroz verde and Mushroom and Leek Migas. Nervous about adding spices and hot chili’s to your cooking? Don’t be, Meagan is there to explain all about southwestern cooking and the book wont let you down. 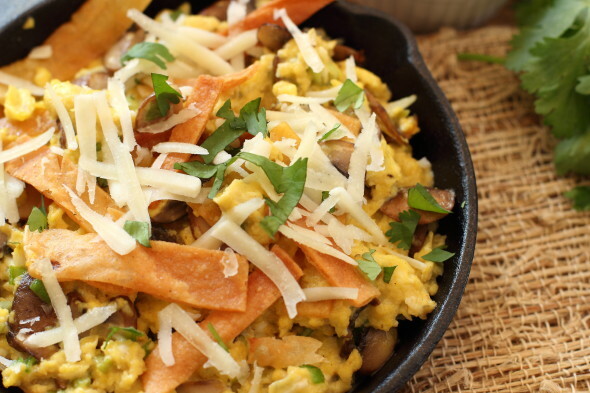 It’s this Mushroom and Leek Migas that the group is making this week. Next week there’s a different recipe so keep an eye out for that! 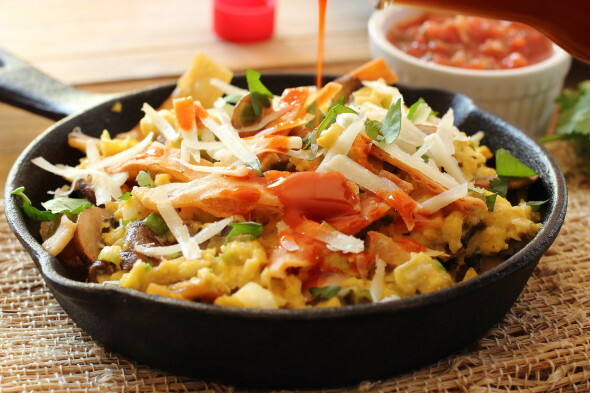 Migas translates to “crumbs” in English but fear not because this isn’t a crumbly dish at all. Sauteed crimini mushrooms are combined with diced leeks and garlic and bound together with eggs and cream. Oh and did I mention it’s topped with grated Manchego cheese? It’s so simple and fast to make that it’s a no-brainer for a weekend breakfast. 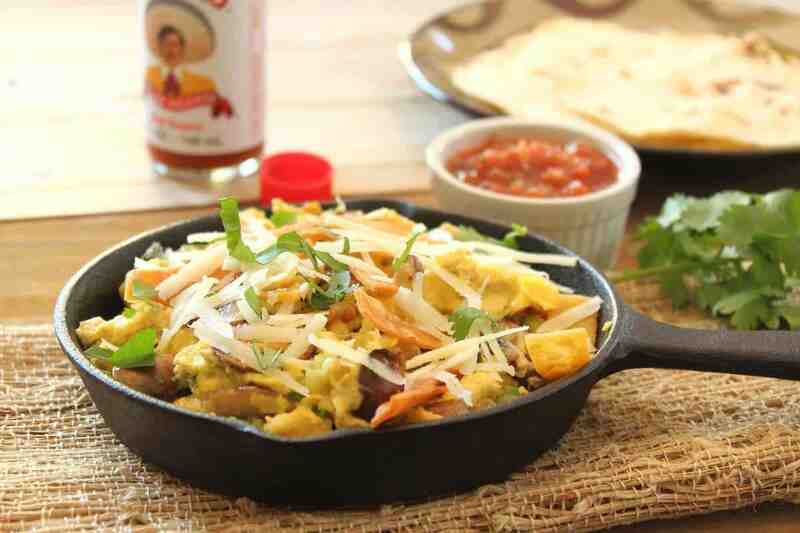 Make sure to have some warm tortillas on hand to scoop up the Migas, splash it with some hot sauce and enjoy. I actually halved the recipe from the book as I was on my own when I made it, but the recipe I printed below is the original recipe size. This breakfast midges is tasty and loaded with flavor! Heat 1 cup of the oil in a heavy pan over a medium heat. Cut the tortillas in half and then cut into thin strips. When the oil is up to temperature, place some of the tortilla strips into the oil and fry for about 2 minutes. Take the strips from the oil and lay them on a paper towel. Fry all of the strips and set aside. Add the eggs and the cream to a bowl and beat together. Set aside. Empty the pan and wipe clean with a paper towel. Heat the remaining 1/4 cup of oil until hot. Add the sliced mushrooms and saute for about 3 minutes. Add the leek and cook for a further 2 minutes. Add the garlic and mix through for about 1 minute. Add the beaten egg mixture to the pan and stir the contents gently like an ommlette. The eggs will slowly solidify. Add some of the tortilla strips and stir through gently. Remove from the heat and add the grated cheese over the top of the eggs. Garnish with some more tortilla strips and fresh cilantro if desired. Serve at once with some warm tortillas and your favorite salsa. Thanks Heather, It’s always great fun doing the cook book reviews! This is the second version of this I’ve seen recreated and it looks os delicious – I really need to get this cookbook!! Sakes alive, Gerry! Making migas look amazeballs and making me blush all at the same time. Seriously, your shots are gorgeous and I’m so happy that you enjoyed the migas. Cheers, my friend! Cheers to you, I can’t wait to see what I can make next! I’ve never tried migas but these sound so good – love the mushroom/leek combo! love this. . give me anything with leeks and Manchego cheese and I’m happy. very happy. and I’m totally eyeing this cookbook, thank you! Thanks Deb! 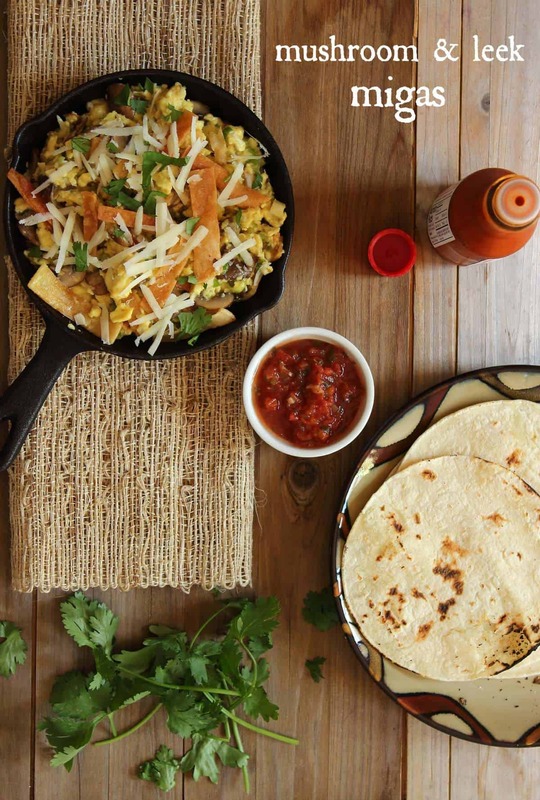 Glad you liked it..
I’ve never made migas before but it sure sounds good and looks great from your photos. Sounds like it will be a great southwestern cookbook. You can never have too many. Nice recipe for breakfast, lunch or dinner. Your styling and photography are aces, Dude. This looks delicious Gerry. I like the addition of the heavy cream. I can’t wait to try these.